Michael Wasley said his shock first-round World Championship victory over Ding Junhui has made him even more hungry for success. On his Crucible debut, the 24-year-old beat the world number two, and winner of five ranking titles this season, 10-9 in a thrilling final-frame decider. 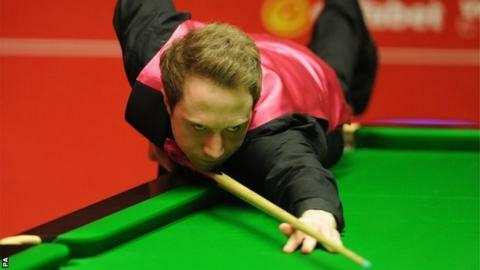 The world number 75, from Gloucester, will now face 13th seed Mark Davis or Dominic Dale in the next round. "It's been amazing. I have a got a big taste for it now," he told BBC Sport. "You dream of playing at places like this. I adapted straight away and felt comfortable." Ding held a 6-3 overnight lead at the Crucible Theatre but Wasley reached the second round after recording a break of 103 to force a deciding frame. Wasley also had to win a dramatic last-frame contest to secure his place at the World Championship - a 10-9 win over fellow Gloucester player Robert Milkins in the final qualifying round. "It has taken a lot of hard work and a lot of support from a lot of people," added Wasley. "It's fantastic. I feel great. I was really nervous but managed to put it to the back of my mind and hold it together." Wasley's manager, Paul Mount, watched the first-round game from Sheffield and has backed his player to continue his form. "If you can beat the world number two, you can beat anybody," Mount told BBC Gloucestershire. "He must be thinking now that he can go all the way. There's nothing to stop him. He's as good as anybody else there."